If you run a cleaning business, auto detailing shop, or a large warehouse, you want them to have the right floor cleaning equipment for a variety of jobs. This equipment will help you clean just about any surface – hardwood floors, tiles, flat carpets, thick carpets, and more. The type of equipment you buy will depend on the type of cleaning you want to do. If you just want to remove stubborn dirt stains from your carpets, you’ll have different cleaning equipment needs than if you were looking to polish your grungy floors so they look as good as new. You also have to determine the size of the area you’re looking to clean. 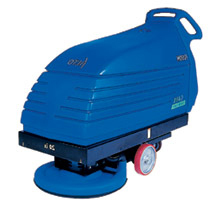 Floor cleaning equipment is based on its coverage area rating – how much space it can clean for a specific job. A small home floor scrubber, for instance, may clean the floors in your apartment, but it won’t be able to handle a large warehouse. In addition, you have to be aware of the size of entryways and aisles so you know if you can easily navigate the equipment through tight spaces. More than likely, you’re going to want to purchase floor cleaning equipment that’s quick and easy to use. That way, your staff will spend less time on maintaining your floors and more time on other important maintenance tasks. Floor sweepers: Handle most cleaning jobs for basic dirt and debris removal. Floor sweepers are akin to ultra-powerful vacuum cleaners. Floor scrubbers: Use cleaning solution to get into deep carpet surfaces and in between tiles. Floor sweepers/scrubbers: Industrial-powered vehicles to handle multiple floor sweeping and scrubbing jobs. Operators of these cleaning vehicles must be fully trained and licensed before they can use them. Floor buffers: Polish hardwood and marble floors to a showroom shine. Carpet extractors: Cleans indoor carpeting and vehicle upholstery faster than hand washing. Carpet extractors use strong pumps that shoot streams of water into the surface of the fabric, motors to remove dirty water from the area, and heating mechanisms to break down stubborn dirt and grime. You’ll often hear these machines referred to as floor maintenance equipment or floor maintenance machines. Also, a floor polisher serves the same purpose as a floor buffer. In terms of floor cleaning type, do you have a preference for a walk-behind or rider? What specific type of floor cleaning equipment do you desire? How much square footage will your floor cleaning machine need to cover?